When Robert J. Silbey arrived at MIT looking for a job teaching chemistry in 1966, the hiring panel thought he was a brilliant researcher whose personality hinted that he might become one of the rare scientists who excelled in the classroom, the lab, and the boardrooms of academia. Dr. Silbey, a popular professor who was dean of the School of Science from 2000 to 2007 and head of the chemistry department for eight years, died of leukemia Oct. 27 in his Back Bay home. He was 71. 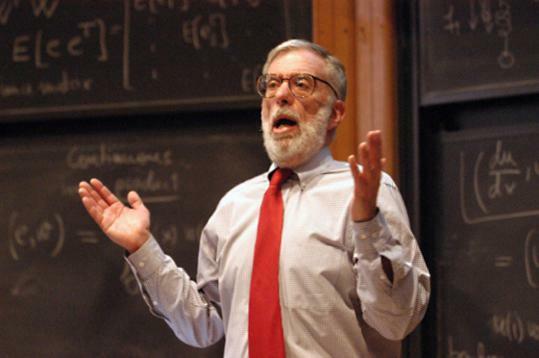 Whether teaching thermodynamics or theoretical chemistry, Dr. Silbey won students’ attention with his humor, high energy, and stories told in his unmistakable Brooklyn accent. Dr. Silbey received nearly every teaching award conferred by MIT, including the Baker Award for Undergraduate Teaching, voted on by students, the Graduate Student Council Award for Teaching, and the School of Science Teaching Award. Once, returning from a trip to England, he found that students had filled his office with balloons. United Press International circulated a photo of the prank. He grew up in New York City, where his father managed a food processing plant on the waterfront in Brooklyn and his mother was a homemaker and Red Cross volunteer. His older brother, Joel, became a history professor at Cornell University. Dr. Silbey spent much of his youth in pool halls, winning pocket money and worrying his mother, according to his wife, Susan, who is the Leon and Anne Goldberg Professor of Humanities at MIT and a professor of sociology and anthropology. “He was a totally unpretentious person,’’ said Dr. Silbey’s wife, who first met him in high school when she was 15. He was a year older and had several girlfriends, she said. They didn’t start dating until they were both students at Brooklyn College. He tutored her in chemistry, and she drove him to class in her quirky Ford Anglia. Their shared commute helped spark their romance, as did their shared love of the Dodgers, the baseball team that left Brooklyn when they were teenagers. “He was both serious and funny, and you could have really great conversations with him about anything from baseball to world politics and philosophy,’’ she said. They were married 49 years and had two daughters. At Brooklyn College, Dr. Silbey became friends with fellow chemistry student Bruce Berne, who is now a professor at Columbia University. Dr. Silbey was unique in academia’s highest levels, Berne said. After graduating from Brooklyn College in 1961, Dr. Silbey went to the University of Chicago, from which he graduated in 1965 with a PhD in theoretical physical chemistry. He did postdoctoral work at the University of Wisconsin before being hired by MIT, and was awarded a prestigious Alfred P. Sloan Foundation fellowship in 1968. In the 1980s, Dr. Silbey’s research focused on excited atoms and energy transfer, providing some of the first quantum physics calculations in the field and spurring new experiments. In 1990, Dr. Silbey became head of MIT’s chemistry department. He held the post for eight years and became director of the Center for Materials Science and Engineering from 1998 to 2000. He also served on the committee that produced a landmark report on the status of women faculty in science at MIT in 1999. His most recent research focused on energy transfer and quantum physics in photosynthesis. In 2003, Dr. Silbey was named to the National Academy of Sciences, one of the top accolades in American science. He also was a fellow of the American Academy of Arts and Sciences, the American Association for the Advancement of Science, and the American Physical Society. He taught his last classes at MIT in May. By summer, he had lost his sight because of complications of his illness, but continued working on a research paper with Oppenheim and another scientist. The paper has been submitted to the journal of the American Physical Society. A service will be announced for Dr. Silbey, who in addition to his wife, Susan, and brother, Joel of Ithaca, N.Y., leaves his daughters Jessica of Brookline and Anna of Cambridge and four grandchildren. “The unique thing about him was he could do superb research and he could deal with all these people in his administrative state as chairman of the department,’’ Oppenheim said.